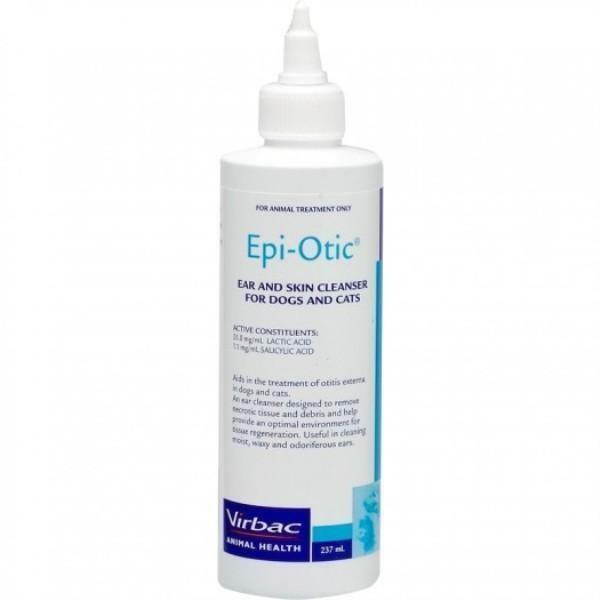 Virbac Epi-Otic 237ml is designed to remove necrotic tissue and debris from superficial skin lesions, and help provides an optimal environment for tissue regeneration. It is also very effective in cleansing moist waxy and odoriferous ears. Indications: Ear and skin cleanser designed to remove necrotic tissue and debris from superficial skin lesions, and help provide an optimal environment for tissue regeneration. Useful in cleansing moist waxy and odoriferous ears. Aid in management and prevention of inflammation of the external ear. Aim tip of bottle into the ear canal and squeeze to apply solution; gently massage the ear. Wipe afterward with cotton wool. My dog developed yeasty ears. The vet used this product and showed me how to squirt it in, then use cottony cosmetic pads to reach into his ears and clean them out. Smells great, too.